SUMOSU Stations are both, a public service of fast charge for particular users, as well as a private charging station for hosted carsharing fleets. Level III fast charging provides a method to alleviate “range anxiety” for the driver of passenger EVs and will likely be a necessity for many types of fleet drivers – especially taxis or delivery vans. Slow charging is typically associated with overnight charging, and is the ideal option to charge carsharing vehicles. One of the main advantage of SUMOSU Stations over the popular approach of DC fast charging station is the use of a single converter for multiple slots. 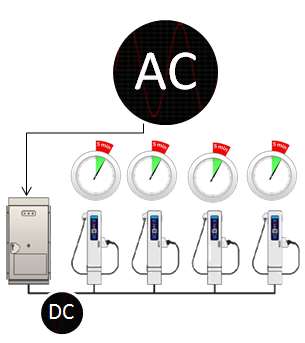 Conventional fast charging stations contain a AC/DC converter per charging point and without any storage capacity, while our solution is based on the use of a single AC/DC converter for multiple charging slots leading to a common DC bus architecture as described in Figure 2. In that case, the complexity of the power converters, and also the cost, can be minimized. In order to benefit from the advantages of a slow charge, like avoiding battery overheating or, the station provides a programmable timer system. Microgrids can be deﬁned as a power system composed of Distributed Energy Resources (DER) that can operate as an electrical or thermal generator, a storage system or as a load, to provide maximum electrical efﬁciency with minimum incidence to loads in the local power grid. Since the elements that compose the system described can be considered as DER, the whole system can be considered as a speciﬁc case of a microgrid with controllable loads (electric vehicles), storage devices and grid interconnection. Generation assets like renewable resources are not included in the first stage. However, SUMOSU Stations provide a convenient way to integrate microgenerators. In further research the integration of microgenerations will be considered.